…<slow clap>…Well played SufferFest…Well played…. 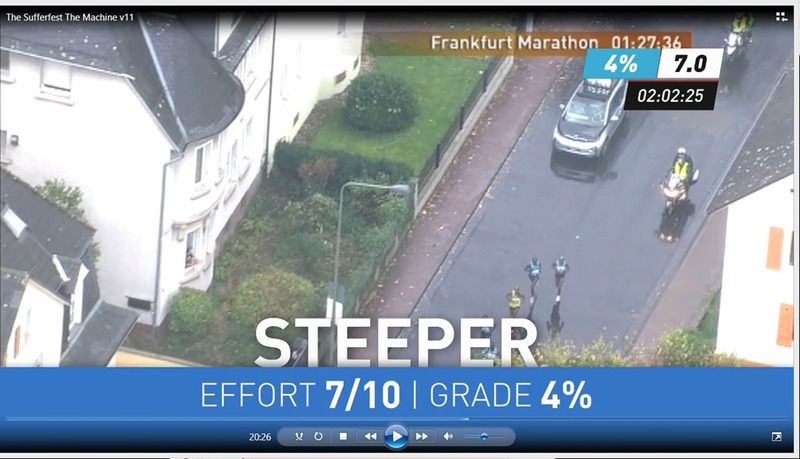 I was lucky enough to get my hands on a pre-sale copy of the new Sufferfest Running Training video so I could review it. For those that are not familiar with the Sufferfest collection, you’re missing out. Up until now, they have been primarily focused on stationary cycle training videos. To put it mildly, those are simply awesome..how could this not be? Their videos have a great mix. Wicked workout, excellent music and pretty neat video footage. Their angle is to put you right into the middle of the various races or events with a bit of a story line and objective. Directions and objectives are easy to follow . This is their first jump into running, and all I can say is it’s about time!! This is going to make some of those Treadmill runs much more enjoyable! Err…maybe enjoyable is not the right word. The premise of this video “The Machine” is this. You’re from the land Sufferlandria and you’re on a world tour of marathons. They are sending you out because you are so “advanced”. To keep it fair, they have created a special machine for you that will make you run up hill the entire time while racing against others. The grades will vary!! The screen while running will look something like this so you’ll need to keep an eye on it…but it’s a great distraction from the effort and easy to figure out. In this case, the 6.0 is your effort ( Marathon Pace) , the 3% is the grade/incline of the treadmill and the red counter beside appears when you’re getting close to a change up of effort. Easy right? Think running your 5K flat pace but at an 8% grade!!! OK? get it? This is the real deal and it delivers everything the cycling videos do and more. On a serious note, many people could be intimidated..don’t be. This is meant to deliver a serious package while keeping it fun and light. Running an 8% grade at a 5K pace is not easy, and it caused me to buck a little bit. Most of us train for the journey, and if at first you don’t succeed…try again. But the workout is varied and offers a few different things and I guarantee you can probably do most of it. You will come away proud that you tried and wanting more! Workouts were designed by elite coach Neal Henderson of Apex Coaching. He also designed several of the most popular cycling workouts. The Machine will cost $10.99. The other two videos are Steamroller (45 minutes and $11.99) and Revolver (30 minutes and $9.99). They will be available as a bundle for $28 for a limited time. It’s a great deal and I cannot wait to get my hands on the other two! Did it beat me down? Did I break?…..okay okay..I jumped off the belt once!! C’mon..8% grade at a 5K pace!! I told them to bring it….they told me it would be brought…and I’m pretty damn impressed. I love it and have a new objective. Keep it coming Sufferfest!!!! You’re not scaring me! Cheers and enjoy the day! Next Article What do you think about ?